In 2001, the iPod changed everything. Portable media players began to spring up like weeds in the crack of a driveway, flourishing for a while — until the smartphone arrived. With their limited storage capacities, phones eventually led to the rise of streaming services like Spotify which quickly rendered the MP3 model antiquated, and favored the limitless collections of music hosted from the cloud. But MP3 players didn’t simply roll over and die when the smartphones showed up. Instead, they pivoted. Those with sizable music collections will often find their smartphone‘s storage inadequate, especially since apps and music will end up competing for space. Many dedicated MP3 players offer big hard drives, meaning you’ll be able to fit your favorite band’s entire discography on a single device. The exercise world is another niche that MP3 players have slid comfortably into. While smartphone screens grow larger, smaller media players offer the user a lightweight alternative that won’t make your pocket bounce to and fro during a workout. Audiophiles, too, can find devices built to handle high-quality audio in one of several file formats. Although some of these players find themselves floating up toward (and in excess of) $1,000, there’s one that rises above the tide for a reasonable sum. To help everyone find the right dedicated music player for their specific needs and wants, we’ve picked out our favorite MP3 players below. Astell & Kern AK Jr.
Why you should buy this: It’s powerful, versatile, reasonably priced, and produces extremely high-resolution audio. The AK Jr. is expensive, but it is worth its high price if you value audio quality. Who it’s for: Music lovers and casual listeners who don’t want to break the bank. 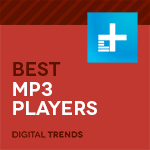 Most companies don’t generally charge just $300 for their entry-level MP3 player. Then again, most companies are not Astell & Kern. The AK Jr. — which retails for about one-eighth of the cost of the flagship model, the AK380 — produces some of the highest-quality sound out there. The beautifully angular Jr., measuring 4.5 x 2 inches and weighing just 3.28 ounces, features Astell & Kern’s signature volume wheel, which offers finer control than the traditional 1-through-10 volume setting on a phone or player. The player’s touchscreen is framed in an attractive matte aluminum shell and its battery lasts for 6 to 8 hours. The Jr. features Bluetooth connectivity, but no Wi-Fi. All the bells and whistles are here to service the sound. You’ll be hard-pressed to find a device that produces the kind of depth, clarity, and balance that the AK Jr. churns out on a song-by-song basis. Its Wolfson WM8740 Digital Audio Converter (DAC) is comfortable processing several different audio formats, from WAV to FLAC to single-rate DSD codecs, and the player features 64GB of native flash storage, with an SD slot so you can add another 64GB if need be. Never before has there been a device this affordable that produces true hi-res audio. Put simply, the AK Jr. is a top-flight portable music player whose reasonable price belies the power within. The Sandisk Clip Sport is no looker, but it’s handy clip, low price, and 25-hour battery life make it ideal for fitness hounds. Apart from the eponymous clip, SanDisk equipped this workout buddy with an FM radio tuner, so you can listen to your favorite morning talk show as you take your brisk pre-breakfast stroll. The player features an LCD screen so you don’t need to rely on the “shuffle” function. The Clip Sport includes 8GB of onboard flash storage, as well as an SD card slot that allows for more storage space to be added in later. Capable of handling most audio file types (including FLAC files), this little guy is perfectly equipped to handle a marathon or a Tough Mudder. Plus, its low-risk price tag means you won’t need to panic if it somehow falls into a puddle. If you’re looking for a classic iPod listening experience with added smartphone functionality, the iPod Touch is just the ticket. The iPod Touch is small and light, and comes wrapped in cool metal finishes, with a gorgeous retina display that makes browsing between albums easy. It even has both forward and rear-facing cameras for snapping the odd picture on the go. Plus, up to 40 hours of battery life is enough for a full work week of listening. If you are really serious about sound quality but you don’t have the budget of a corporate bigwig, the Activo CT10 may just be the perfect portable music player for you. Created by Groovers Japan in partnership with Astell & Kern parent company IRiver, this tiny touchscreen player offers fantastic sound and 16GB of onboard storage, expandable via a built-in SD card slot. It also has a Wi-Fi connection onboard, allowing you to listen to Tidal and other high-fi music streaming services. A beautiful 3.4-inch touchscreen allows you to easily pick between media and adjust settings like EQ, and an easy-to-use volume knob on the upper right side lets you pick how loud you want things to be. The CT10 has a simple 3.5mm connection on the top, allowing you to plug in your favorite pair of headphones with ease. It’s also got Bluetooth and apt-X HD support, so you can listen wirelessly in very high quality as well. The CT10 is charged via a Micro USB port, and offers up to 10 hours of play time on the go. The sound is fantastic, easily besting the similarly priced iPod in terms of fidelity. Everything sounds open and true from the tiny little player, making it a favorite listening device when we’re on the go. If you’re after something that sounds great, is hyper-portable, and won’t break the piggy bank, we highly recommend you check out this little player. The LG G7 ThinQ is simply the best smartphone for audio, hands down. It has a fantastic speaker (for a phone) and outputs high-res audio. Thankfully, with the LG G7 ThinQ, you don’t have to choose. The same Quad digital-to-analog converter (DAC) that we loved on the LG V30 returns in the company’s latest model, bringing pristine audio quality to anything you plug into the phone’s 3.5 mm audio jack (!). In addition, the G7 ThinQ also supports DTS.X 3D surround sound, a technology similar to Dolby Atmos. Ultimately, the LG G7 ThinQ is worth a buy if you’re in need of both a smartphone and a hi-res music player. It’s not the king of either category, necessarily, but there are few — if any — phones that can match the quality of its audio output. High-resolution audio uses a higher sampling rate and a higher bit rate than regular audio files. A typical hi-res audio file is sampled at 96kHz/24bit, which means that the audio is ‘sampled’ more frequently each second than a typical MP3 file, which loses around 90 percent of its information during the compression process. Hi-res files (like FLAC files) process information more than 20 times faster than MP3 files, which means that those little details in the music — such as the attack and decay of a single guitar pluck — can be heard more clearly by the human ear. MP3 files are quick and dirty representations of actual songs that have been compressed in order to save storage space. High-resolution audio, on the other hand, is compressed in such a way that those little details are preserved. You might be wondering how, exactly, we came to these conclusions. As the market for MP3 players has thinned, devices must fit snugly into a niche — or be left out in the cold. For hi-res options like the AK Jr., there’s only one way to test: with variety. We tested the AK with several different genres of music across several different file codecs, with several different pairs of headphones. When it performed admirably across the gamut of variables, we knew we had our pick. We also do extensive phone reviewing, and picked other MP3 music players based on their ease of use or usefulness in a particular situation.